I was in charge of the family Christmas party this year. I'm happy to be able to say that in the past tense! It's not that I don't like Christmas (I do), and it's not that I don't like to plan things (I do), and it's not that I don't like my family (I really, really do!). It's just that it was a lot of work and I was on my feet all day yesterday and today I'm quite happy to hang out on the couch and recover. Poor couch. You missed me, didn't you? We got home late from the party and didn't unload the vehicles, but went straight to bed. Or as straight-ish to bed as we can, which isn't actually very straight, so I'm all the more tired. Of course, my dad had an early - morning doctor's appointment I had to take him to today, but the vehicle was still full. Who schedules these appointments so early, anyway?? Oh right, I do. Gotta quit that. And we still had boxes of table decorations and games and rolls of tape and a hot glue gun and bins of stuffed animals and soiled tablecloths and kid chairs and I don't know what else was back there but it wasn't safe. The vehicle had to be cleaned out before I could go. I knew it would take me quite a while to haul all... that... into the house on my own. But the older boys were asleep and it would take even longer to wake them. I tried it anyway. "Boys!" I flipped on their bedroom light. "I need to take Opa to the doctor but the vehicle is still full. I need to leave in 10 minutes - could you help me unload it, please?" Not expecting any response, I put my coat on and shoveled down the sidewalk. The first boy was out before I finished clearing a clear path my dad wouldn't slip on. Granted, he didn't have a coat or even shoes on, but I was so grateful he came. 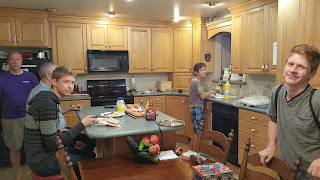 In just a few minutes, I had all three of my big boys hauling boxes into the house. What would have been a time-consuming, arduous chore for me turned into a few quick loads for each of us, and then we were done. I drove away on- schedule, leaving bare footprints in the driveway but bringing gratitude in my heart. See what wonderful things our family can do together that would be harder to do alone? Thanks, boys. Yore mama loves you! As we pause this Christmas Eve to remember the birth of a baby in a stable, we want to extend warmest wishes to you and your family. I wish we would light a candle from the happiness in our hearts and hand it to you, to help you light your part of the world. David came home and said he needed to do some extra credit for his French class. 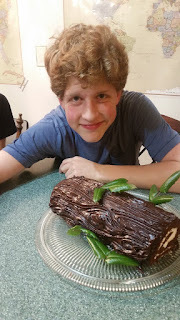 I gladly let him use the kitchen for his cooking project, and he whipped up this yule log. It's a pretty impressive chocolate jelly roll cake with a whipped cream filling and thick chocolatey frosting. He pulled leaves from the holly bush out front to dress it up and presented it under a silver cake cover. 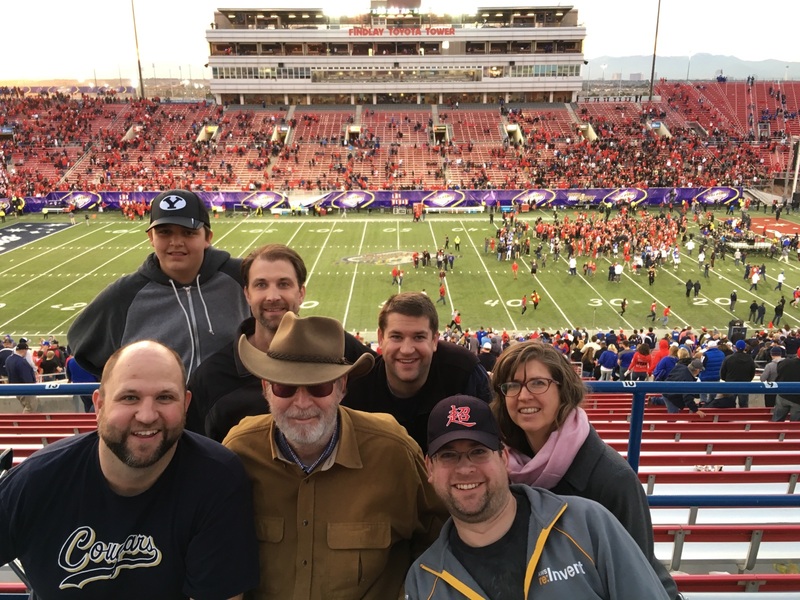 I'm not sure how it all started, but my dad got it in his head that he needed to go to a football game. The man hasn't been in a stadium attending a football game since... oh... I was in college and worked at the stadium and got him free tickets. That's been a while. But this year, he needed to go to a game. It was a challenge, because the regular season games were over. No worries. My brothers jumped on the idea of a family road trip and we all went! I'm still a little gobsmacked that it even happened. The last time me and my brothers were on a road trip together was when we were headed to Disneyland in 1987 in a borrowed RV which gracefully broke down in the middle of an LA freeway. During rush hour. What great memories! We hope to have a little bit less adventure on this trip, so we took a more reliable minivan. And shoehorned me and all of my very tall brothers in it. We were... cozy. We ended up making some fun new memories. It wouldn't have happened without a dream, some quick decision-making, four good-natured sisters-in-law, and my loving husband. We couldn't have gone without them keeping the home fires burning. And hey, maybe we'll do it again sometime. In another 23 years, maybe? So this week I get to see my missionary boys! No, this Mama is not excited at all. And that's a lie. One will be skyping Christmas morning, and the other on Christmas night. Somehow I'm thinking Christmas will be a longer day than usual, but I'll take it! 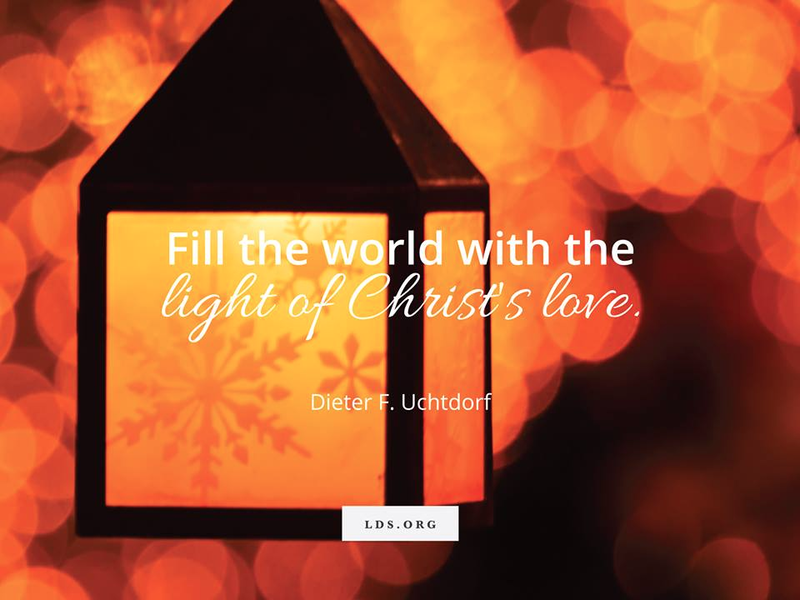 I love that on the very day we celebrate Christ's birth, we can visit with two missionaries who are devoting their lives right now to serving Christ in the best ways they know. But now we'll just go to Malagasy Morsel time. It's Jesoa Kristy. Guess what that means. It means Jesus Christ. I'm sure that was a hard one. And that's what Christmas is all about. I love it.But I just kind of had a cool story from yesterday that I wanted to share with y'all. We got home from church and were watching Mormon Messages on Elder Snell's USB while we were making our delicious spaghetti. And there was this one video that had a little clip of Jesus walking with his disciples and I just thought to myself, "What I would give to get to walk with Him and learn from Him every day." And as soon as I thought that, the next thought came into my head, "That's exactly what you're doing right now." 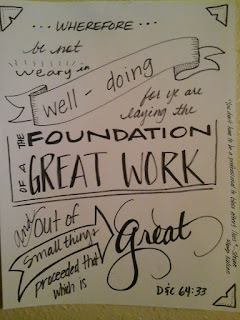 I get to do his work and I get to learn from Him from the scriptures every day and we all get to do that! I love it so much! That just made my day. So I'd like to wish you all a fantastic Christmas and don't forget to do some things that our Savior would have you do to let you come unto Him while you're all celebrating Christmas. And as always, you can see the South African blog here and the Madagascar blog here. I look a lot different now. My dad took this picture the day before Jay went into brain surgery. Jay was joking that it would be his obituary shot, but it wasn't. We were in my folks' backyard, in front of their apple tree. Those little green apples remind me of my boys, so young then, but growing up quickly. To celebrate our family birthday, we had spaghetti on china, with sparkling grape juice poured ever so carefully into crystal goblets. It's a tradition to eat something regular on fancy dishes, because our family is a bunch of regular, common, everyday and nothing impressive things, made special by our enduring family ties. Happy birthday to us, and many more. She is a girly girl, and loves to wear fluffy skirts and twirly dresses. She is drawn to sparkly hairbows and anything pink. Her brothers worry that she will be a princess, but I don't. I was an only girl in the middle of a bunch of brothers, too. I'm having a good time helping her grow up. 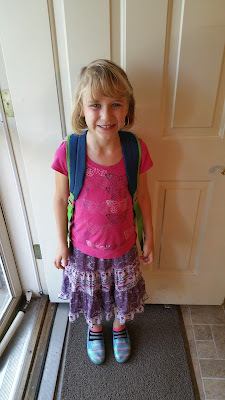 This is her favorite skirt, which I think pairs very nicely with the tomboy bruises on her shins. 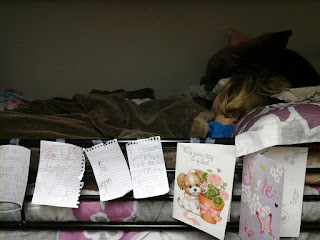 She had to write a love to to her friend, with her very best handwriting and lots of crossing out of misspelled words. She loves to write and draw. As she looked at the card, she exclaimed, "Oh I love periods. They are so fun!" What a cute girl. I'll bet she'll never say that again. 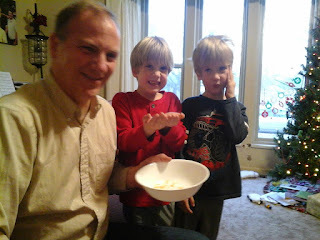 Trent got home from work late, and walked in while the twins were finishing up a bowl of tortilla chips. Amidst cries of "Daddy's home! 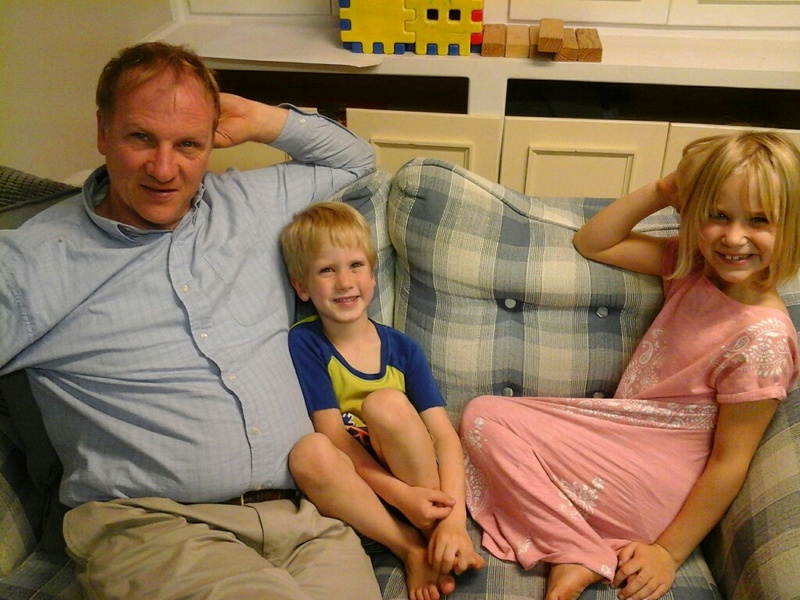 ", he got clobbered by four little arms and two little boys who love their daddy fiercely and hug him tightly. When he let them go, they returned to their chips. Guiltily, they looked at the nearly- empty bowl and back at Trent. After only a slight hesitation, they grabbed the last big chips in unison and offered the bowl of crumbs to their beloved father. From their loving expressions, it was clear that the salty crumbs were the most delicious, but Freddie and Georgie were willing to part with them. It was a tender moment with a side order of funny. That's how we live in this family. This week, we had some pretty hefty winds. I saw a picture that someone had taken of the middle of the winds. The current next to the ground was heading left, and the higher current is going right. The clouds in the middle are being blown by both currents. I am amazed at how beautiful this is. The contrasting currents pull the clouds in opposite directions, making graceful curves and swirls. It couldn't be prettier if it had been sculpted. Sometimes I feel like I am pulled in different directions. 10 different directions, to be exact. Every child has needs. The house has needs. My husband has needs. My church calling has needs. My kitchen has needs. Oh, and I need things too - how can I take care of everything? And all at the same time? I often feel stretched thin and buffeted about. But maybe, from a different perspective, it makes lovely swirls and loops. Maybe God is making beauty out of my chaos after all. We had a hot date. At least, I was hoping it would be hot because I have been so cold. It was his turn to plan, but it was late and I was tired and cold and didn't want to do anything but curl up on the couch with a big blanket. So he bundled me up and took me to the bookstore. We browsed a bit and then sat. It was delightful to be out together. How lucky am I to have this wonderful man in my life! I am so tired. So really, really tired. That is a big reason why my writing has faltered over the past several months. My health has been failing. Failing. I pause over that word. It sounds so dreadful and dead-full. I'm not dead, and I won't be for a long, long time. I'm too stubborn to go ,I've too much work still to do, and God's not done with me yet. But as I think of the word "failing," it works for me. I often fail. And I often get back up again. Sometimes it takes me a while to get back on my feet, and sometimes I'm quicker. But there should be no shame in failing - only in the refusal to try again. So yes, my health was failing. My body was not functioning properly. There is no shame in that. I'm working on making better- and different - health choices, and am under the care of a few good health providers, so I'm getting better. Slowly, but surely, I am healing. But it all makes me so tired. To my credit, nearly all the Christmas shopping is done. I just have to pick up the gifts for my man and we're there. I've started wrapping. The tree is up and has lights on. Maybe we'll even put some ornaments on one day. Maybe. The lights are up on the front of the house. I successfully navigated two Holiday parties without falling apart. We've gone to one Christmas concert (David's choir was absolutely angelic. I don't usually expect that from a junior high chorus, but they sang straight to my heart this year. ), and we'll hit another one tonight (Eddie's beginning band concert. Should be fun.). My kids are well fed and happy for the most part. I finished the laundry. My house is passably clean. Everyone made it to school on time this morning. And now, I shall go take a nap. We got our Christmas packages off a few weeks ago. I'm afraid they aren't as interesting as they could have been. I'm not a very good package-maker. I can think of lots of fun things to put in a package AFTER I've sent it, but before...? I draw a blank. Besides, we don't have long until these boys come home, and I don't want to take up their luggage space with useless trinkets. Not long until they come home? Yes, it is true. Only three months for the one, and six months for the other. The one who comes home sooner, I think might like to come home even sooner. 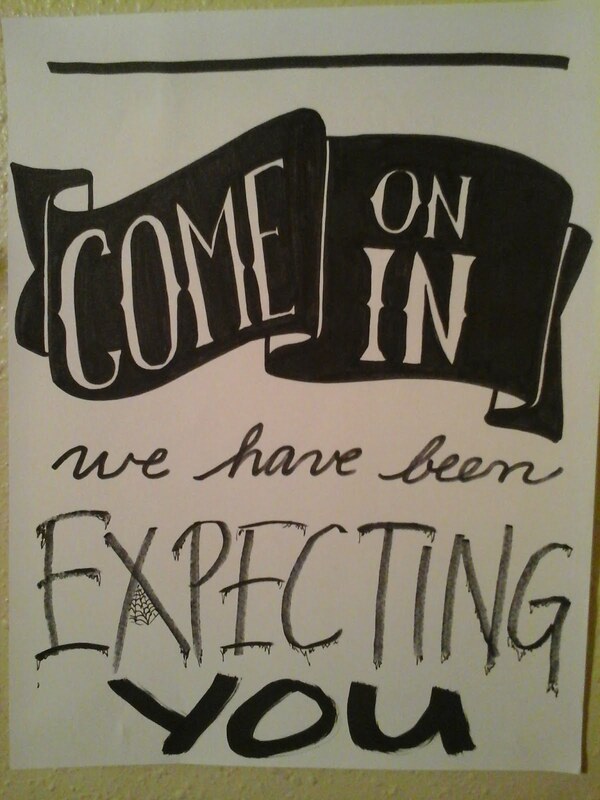 Having a cute girl waiting anxiously for your return will do that to a guy. Ironically enough, the missionary who comes home later is wanting to extend his mission and come home even later. Why couldn't we have reversed these two, and the sooner would come home later and the later would come home sooner - and they would come home in the middle, at the same time! Then I would jump on a plane and fly to Africa and pick them both up and have a lovely little vacation and time with my boys. Here's the real scoop on Madagascar. And South Africa. I'm just glad they are happy and doing well. May the Lord continue to bless them and keep them safe! I love to write. I have love to write - composing words - most of my life. 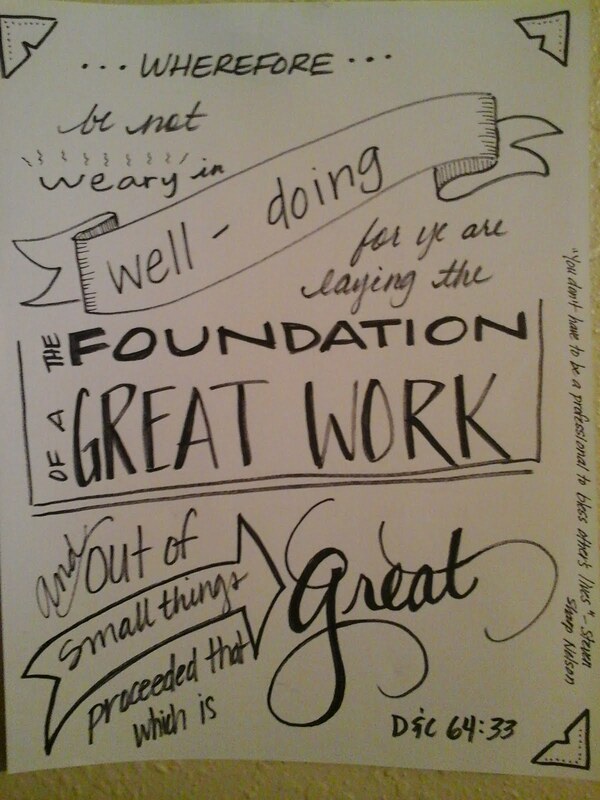 I'm not that great at it, but it doesn't matter. I'm probably like that one kid at the dance who is blissfully unaware of how truly bad he is at dancing, but just closes his eyes and flails about to his version of the music and loves every moment. I'm trying to get back into writing, but I'm out of the habit so I just don't think about it most days. Need to find ways to make it a new habit. Even more happy for me than writing, though, is WRITING, making shapes with a pen. I love to make a message beautiful. Being the daughter of a printer, I was into fonts before fonts were a thing, and I begged my dad to give me his old font books. I would pore over them for hours, like a Christmas catalog, highlighting my favorite ones. Then I would spend all my junior high spare moments in writing the name of my latest crush. Not with my name, mind you. Just his name, over and over in every typeface imaginable. I haven't written much in the past few years, partly because I've been raising humans, and partly because the current fascination with fonts means that my handwritten scripts, once unique, are now just a messy, secondhand version of an easily accessible online font. If it's not as good, I might as well do it more formally on a computer. As a family, we have been studying a scripture every week or so. 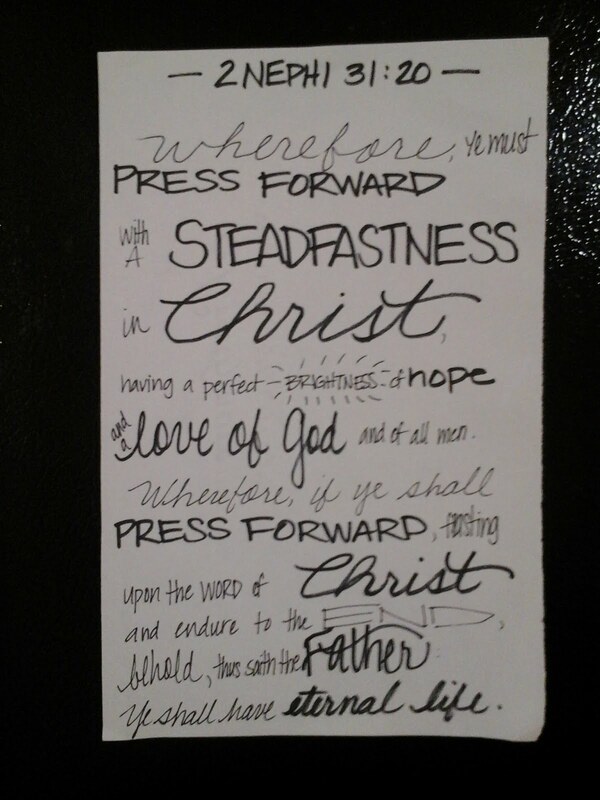 I like to type out the scripture of the week and post it on the wall so we can read it and learn it. Unfortunately, our printer is not playing nicely with the computer. In fact, they are not on speaking terms at all. 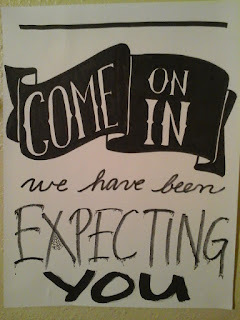 So I had to pull out a marker and scribble a sign. It's been more fun than I thought it would be. It's feeling good to get back into creating. Now I need to find a good marker that will work every time, not just some of the time. And don't let the marker talk to the printer or neither of them will work. I haven't ridden a bike for a while, either. I used to bike often. We would take our little family on a biking outing - me and Jay and three little boys on three little bikes. Then we bought a bike trailer for the baby and Jay pulled it behind his bike. He would go in the front and I would take the rear, making sure we didn't lose anyone. At the time, we lived in a very small town, so the roads were safe. When we moved to the Seattle area, the biking continued because there were so many beautiful bicyle trails. Our favorite went along the banks of the Sammammish River and had frequent parks. Jay would come home from dinner, announce that he wanted to go biking, and start rounding up the kids. I'd take whatever I was making for dinner, attempt to fashion it into something we could take on a picnic (casserole portions wrapped in a tortilla sound good? ), and off we'd go. I like to bike with my kids. I rode with them to school every morning, all the way through my pregnancy with Angel. I loved the ability to get somewhere faster than my lumbering belly usually let me. We got some pretty funny looks, my bike, my belly, and me. Since then however, the cover on my bike seat rotted off. My tires went flat. I wasn't strong enough to haul three little kidlets in the trailer. We didn't ride any more. A couple of months ago, I thought I'd ride anyway. It had been a while, but hey, it's just like riding a bike, right? Running late to school helped me make my decision. Angel was alread zipping up the street on her pink bicycle and the twins hopped on their little red bikes, and I didn't want to run alongside them again, so I pulled out David's bicycle. The seat was good - the tires were pumped. I threw my leg over the center bar and we were off. The children were delighted that Mom - Mom of all people! - was riding a bike with them. They don't know that I used to ride lots. To them, it was novel and fun. And we made it to school on time. I rode home again, enjoying the... wind in my hair! Say that like it was a shampoo commercial. When I got home, I rode the bike up the neighbor's driveway close to the gate going into our backyard. I swung my foot over the seat - and missed. The front tire caught the edge of the grass, my foot caught on the seat, and bike and I went down in a most ungraceful slow-motion disaster. I untangled my foot, rubbed my scraped palms together, and realized that if I tried to stand I would immediately be back on the ground. So I sat there on the neighbor's driveway and gave thanks. I was thankful that I didn't appear to be seriously hurt. I was grateful that my knee was numb enough that it didn't hurt yet. I was grateful that no one watched me fall. I was grateful that my own front door was less than 50 painfully hobbling steps away. I was grateful that I didn't wreck my son's bike because I'd never hear the end of that one! After a few painful minutes, I slowly got up, put the bike in out bike rack, limped to the house and crawled back in bed. I spent a week shuffling around the house and a month not doing anything which required kneeling. I still have a tender lump at the base of my knee, but I'm all functional. I'm so thankful for bodies that heal. And hopefully, getting back into writing will be better than "just like riding a bike." 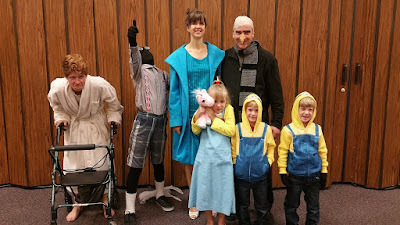 We did Despicable Me 2 for costumes this year, and ended up with Gru, Lucy, Dr. Nefario, Agnes who would way rather wear a dress than short-alls and her fluffy unicorn, two minions, and a nerd-shadow. A wha...? Well, we have a black morph suit and he fit into it this year. He just had to use it. Welcome to junior high. And yes, I had a lipstick taser in my pocket. I took the kids to the zoo today. We. Had. A. Blast. We have a couple of days off school and Trent took the big boys camping. The small fry were feeling left out as they watched Chris load up the four wheelers and David pack the tents and Eddie haul out sleeping bags. They watched forlornly as the campers headed to the mountains. Me, not so much. I'm happy that they get to go four-wheeling and camp out in the mountains. I'm happy they get to spend some good guy-time together. And I'm glad I get to sleep in my own warm bed because it's gonna be cold up in them thar mountains tonight! It's only fair, though, that we do something fun while the big boys are gone. So we went to the zoo. We grabbed a neighbor girl and headed out, playing "I spy" and the alphabet game all the way there. They played at the splash pad and drenched themselves, then ran from one exhibit to another, laughing and giggling constantly. It was so fun to see them have uninhibited fun. 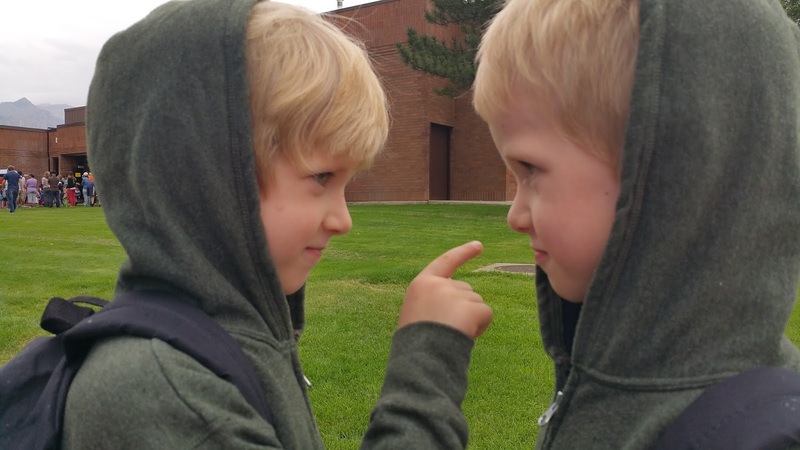 If their older siblings had been around, there would have been plenty of shushing and telling them to grow up. But not this time. We were delightedly little kids. We barked at the seals and growled at the bears and chirped at the birds. And we ran and skipped and hopped and acted like a bunch of little kids, which we were... or most of us were. At the beginning of the trip, I wished I had brought my camera to capture the look of terror on Freddie's face when he thought the water was going to splash on his dry tummy. I wished I could catch the excitement of three little human eaglets perched in a nest. I wished I could forever keep the long shadows following four children skipping along the path. But then I remembered that when I spend my time taking pictures to save memories, I often forget to make them. I don't have the time left over to do the doing when I'm doing the shooting. I'm glad I left the camera at home so we could just play and enjoy... and be in the middle of the living. On the way home, they kept busy in rush hour traffic by mimicking different animal sounds. After they ran out of animals, Margaret piped up with, "Let's hear your very best singing voice!" She began to serenade us with an impressively clear vibrato, and Angel joined in with her favorite operatic warble. Freddy nearly broke down, crying that he couldn't think of anything to sing. From the back-est backseat, Georgie joined in with an enthusiastic... pterodactyl. It was anything but melodic, but so unexpectedly funny. After a moment, when they changed to new sounds, he protested, "I haven't had my singing turn!" As soon as he had our full attention, he began... beat boxing. Never a dull moment with these children. I'm so glad I have them and the smiles they constantly give me. All's right in the world when you are in the middle of a child's hug - or two or three or four. It makes me fell like I'm in the middle of the Lord's embrace. We didn't get a single picture, and that's just fine by me. Ben always thought it would be cool to have a baptism in the ocean, but they usually have fonts in their church buildings. In his current area, they use a portable font that they unpack and fill up when they have a baptism. But this week, the lock on the closet where they keep the font was broken and they couldn't get in. Too bad! To me, there are three wonderful things about this picture. One, just look at that view! I can't get over how gorgeous our world is - I keep turning around and seeing something even more amazing. 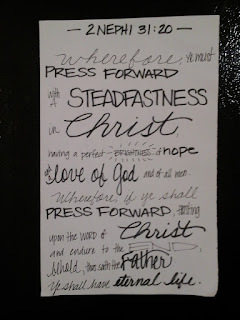 My heart is filled with awe and gratitude that the Lord would make something like this... for me. Two, this is something Ben wanted to do and didn't think he could. I'm just so happy for him. And three, I'm glad that he could share something I hold so precious with these three people who have grown to love the Gospel, too. I wish them every happiness and joy as they embark on this new journey. Here is Ben's account of the baptism. I love how things can be awesome and full of strong feelings and hilarious at the same time. Aren't our hearts amazing that we can feel different things simultaneously? My companion may have had to rebaptize someone 3 times because he kept mistiming the waves and going down at a low point... It was so funny! We were way out there because the beach is shallow and it was just me and the other witness from the branch and we were like "HURRY!!!" and he was rushing the prayer and then we'd get slammed by a couple big waves and the baptizee was thinking she was going to die and then he got hit by a big wave and dropped her in and then as he was pulling her out he got hit by another wave and got knocked over. So he took a little dip. And lost his badge... That's what you get for swimming Elder!!! I was dying laughing! (And then) Elder Price and I are trying to pull Lala out of the water. He was halfway through his prayer and a wave hit so she thought it was time to go under. We were like NOOOO NOT YET!!! And trying to save her. Then I did it once and was done... Haha it was one of the funnest but most spiritual things I've done on my mission. And here is the South Africa blog, too. Love these boys, and I'm glad they get to make these kinds of memories. The pipe kind of organs, not the slimy guts kind of organ. I know it's getting close to Halloween and all, but I'm not ready for that yet. My mother played the organ. Beautifully. I think it was like breathing to her. She and a friend used to do a little touring to different church congregations on Sundays and play piano and organ duets. In high school! She was the organist in Sunday meetings for as long as I can remember. 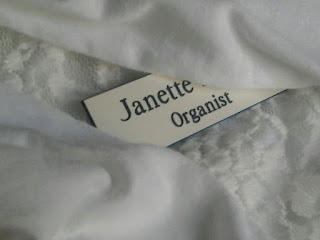 In fact, for a while Dad was the clerk and Mom was the organist. 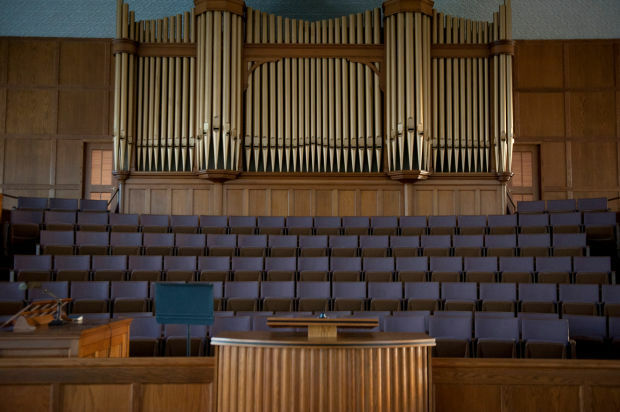 The organist sits at the organ on one site of the stand at the front of the chapel, while the clerk's desk is on the opposite side of the stand. We took turns getting to sit beside Dad while he counted attendance in the meeting and took notes in his fine neat handwriting totally befitting a printer. But for those of us not sitting by Dad... we sat in the back row of choir seats halfway between the clerk's desk and the organ. I can only imagine that we wiggly kids were very entertaining to the congregation. I'll try not to think about that. Our organ was something like this - two manuals plus a full pedalboard. And we had toys on the floor, so yes, this looks very familiar to me. We even had an organ at home. Mom traded in the old, dark upright piano she had as a child for a newer piano and an organ. They sat opposite each other for many years at home. I loved to play on the organ (as opposed to actually playing and making music, mind you), making sounds with all the different stops. And there was a percussion box - the best part! I didn't know that our organ teacher, a man of quiet dignity, was a professor of organ studies at the university! It was years later I learned had studied organ in Europe, won international awards for his performances, recorded CDs, and played on many continents. I was lucky to have such a teacher. It was pretty darn awesome. 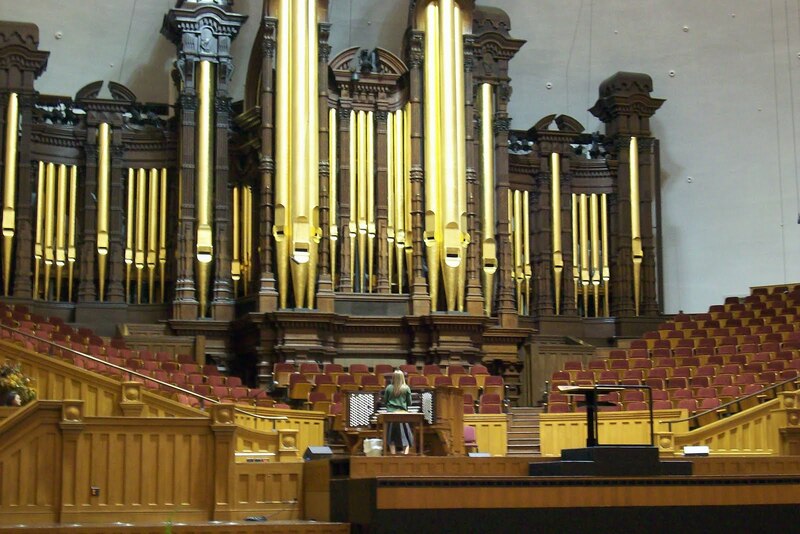 When my roommate, a music major, unexpectedly lost her hearing, she would go into the hall and sit with me on the organ bench. I'd play something wonderfully loud, like Phantom of the Opera, and she'd sigh happily, feeling the music of the organ when she was unable to hear it. I loved, but did not very often dare, to crank it up loud and open all the stops. That only happened on late weekend nights when everyone else was out - or just not in the music building. My favorite stop was the wind chimes that went on in a steady silvery shimmer when their stop was pulled. At that point, I decided that there were two other organs, among the best west of the Mississippi, that I'd like to play one day. And I wanted to play the organ in the temple. What lofty ambitions we have in our youth. As the years passed, I often played the organ for Sunday services at church. I played the organ with toddlers on the bench and a 6-day-old baby in a sling. I taught other pianists the nuances of organ technique. I even arranged piano and organ duets. But I never did take care of those three bucket list items. Until recently. 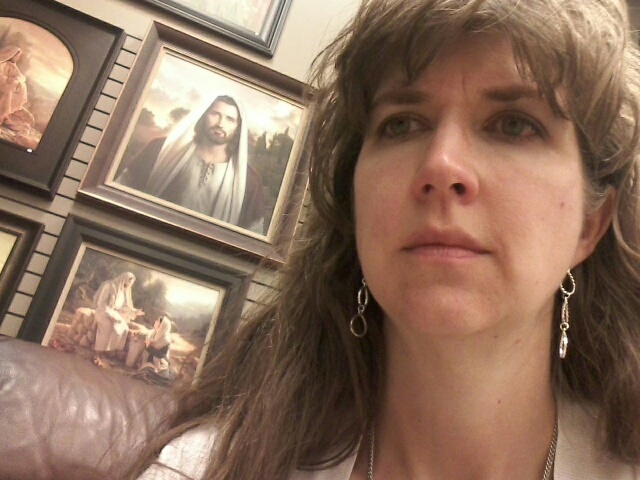 I'm tickled to have a regular shift in the temple now, where I play beautiful hymns to soothe the soul. It's not loud, and it's not technically amazing, but it is pretty awesome. I've never felt such peace between my heart and my fingers. And I'm grateful for that sweet spirit that fills me, and even wafts home with me. The temple is a wonderful place, and I feel it a great privilege to be able to serve a little bit there. I've been learning some good things and wishing there were a few more things I knew as I've been cooking. For as much time as I spend in the kitchen, you'd think I'd be an expert chef and baker by now! * My father-in-law makes the best beef stew ever. That is not superfluous. I've tried a few times, and even the best of my soups don't have the richness of gravy that his does. It's a pretty simple beef chunk/ground hamburger/tomato/potato/zucchini/carrot stew, but I could eat it all day and forever. I'll have to go over and watch him make it someday. *Sourdough bread is really, really good for you. I've done a lot of research on why I can eat homemade sourdough bread just fine while anything with white flour or years gives me a decent stomachache. It looks like I'm not unique there - sourdough is just a very nourishing food. So I keep making sourdough... but I still don't like the tang. It's a bummer to have food I can tolerate but I don't like the taste of. And lately, my sourdough breads have been getting more and more sour. I think I need to start over and read the directions again. *Applesauce is sweeter when we make it together. I watched Women's Conference (which was wonderfully encouraging here, here, here, and here) with a friend and cut up nearly 20 quarts of apples. After they were cooked the lazy way in crockpots, these two minions spent the better part of an afternoon helping me to grind it into applesauce. The bags of Golden Delicious apples my neighbor gave me, seasoned with a bit of cinnamon, didn't even need sugar. *I am more grateful for delicious food. For some reason, my digestive system has gone on a rebellion lately. My doctor put me on a very restrictive diet in order to find out what the problem is. For now, I can't eat white flour, yeast, sugar, dairy, or fat. It seems like that wouldn't leave very much that I can eat, and that is true at a fast food joint. But I have learned to appreciate the wholesomeness of natural foods. And they taste better now. I don't know what I am going to do over the upcoming feasting season (pecan pie and eggnog, I'm looking at you while trying not to. ), but for now, I'm happy to be feeling better. I had a nice, hot shower yesterday morning. So did my husband and my big boys. The little boys and the girl had a bubble bath Saturday night. And this morning, I am counting that hot water as one more of the blessings I usually don't even realize. I'm glad I have hot water and I can take a hot shower. We have so much! I just want to go on record and say that I do not like hot showers. There's not much refreshing about being covered in hot water when you are covered with hot sweat all day. It's like the same. I really like cool showers, like slightly lower than room temperature kind of a deal. But the glacial water imported from the icy peaks of Russia that comes spraying out of the showerhead isn't quite what I have in mind when I say "cool." News from South Africa is that his blog is now updated so you can see that he's been transferred to Queenstown (north of Port Alfred)! Glad he's doing well. It was Jay's birthday recently, and he would have been 48, old man. 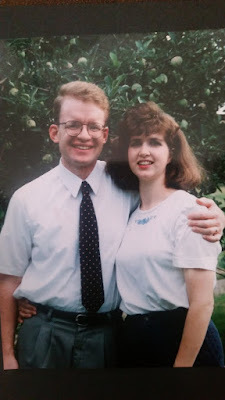 I really enjoyed having a husband who was a few years older than me. He would hit all the age milestones first, and I've have a while to get used to the idea of being that much older. By the time I hit that particular birthday, the age was old hat. 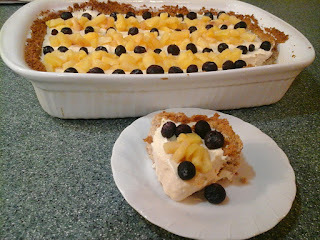 We celebrated by making his favorite treat (except maybe homemade ice cream): easy no-bake cheesecake. It whips up quickly and is ready before you know it. Wait - I'll be real. We did know it, and usually ate the soupy cake with spoons before it had time to set up because it looked so good. First, the crust. Traditionally, we make a quicky crust out of crushed graham crackers, but I finally found a from-scratch recipe that I could simplify and I liked it so much I think I'll always be making our cheesecakes this way, because when we have graham crackers we eat them. The crust is pretty thick, but I like it that way. Then you make the filling out of cream cheese and sweetened condensed milk. The only trick here is to beat it until there aren't any lumps left. Next to waiting for it to chill, this is my hardest part. I guess I just don't have much cooking patience. Usually I just get to the good enough! part and we all like it anyway. This recipe came from Jeanne, my first mother-in-law and it's a family favorite. 1/2 teaspoon ground cinnamon or several good shakes. Mix all together until it is good and creamy. Pat on the bottom and up the sides of a 9 x 13 casserole dish. 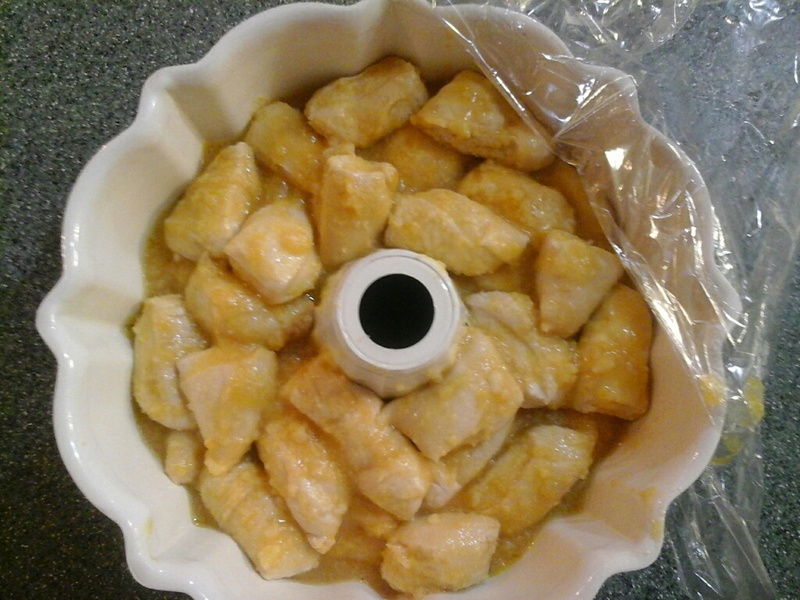 Bake at 325 for about 20 minutes. Easy! Blend it all up together. Pour into cooled crust and refrigerate until firm. Decorate with fruit (we did blueberries and pineapple this time) or a can of fruit pie filling. Raspberry pie filling is especially delicious. It didn't last very long. Good food evaporates around here and leaves only smiles on everybody's faces. I'm happy when they are happy. I have a friend with lupus. It's a nasty disease/condition/curse. She's had a whole slew of challenges with it this past summer, and I ache for her. Well, not really, because her body aches just fine for her all by itself. But I do wish that it could be better and easier for her. One challenge she has right now is a very restricted diet. Her guts will only tolerate a very, very small variety of food. I think if she even thought of eating normally, she would get sick. It's hard to feel human when you have to fix food for your family to eat - that you can't eat. And then to be too tired to fix another meal that you can eat is just kicking you when you're down. Not fair. 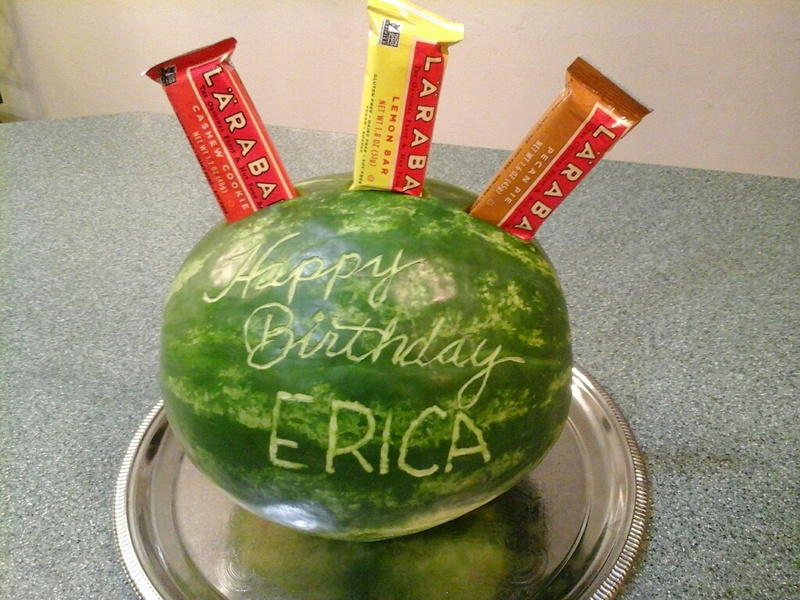 So I wanted to get her a nice cake for her birthday. The candles are special order and I got the bakery to write her name in frosting. I hope you can heal out of this season, dear friend! I'm reminded to be thankful in my kitchen this week. In the past couple of days, I have cooked oatmeal in the microwave, fried up hamburger on the stovetop, baked bread in the oven, made a batch of French toast on an electric griddle, and roasted a big chunk of meat in a crock pot. I don't even know how many appliances, large and small, I have to cook food.I have to remember that not everyone is as lucky to be able to prepare good, clean food as I am. I've got some crazy good news though: We are going to get a stove this week!!! We've been out of propane for a month and a half, and by "we" I mean the whole city of Fort Dauphin... So after lots of dry ramen consumed, we will be getting an electric stovetop to last us until someone in Antananarivo finally sends a truck full of propane tanks at us. I'm so excited for some cooked food at home! The only problem with an electric stove is that yesterday morning, half of our house's lights and plugs stopped working... It's not too bad, but our fridge is not refridgerating and our washing machine is not washing and there's no lights in the bathroom! You really need lights in the bathroom dang it!!! Blessings come in all shapes and sizes and I'm so thankful for all of the great stuff in my life that makes me so happy! Like lights in the bathroom... Haha there's lots of things we take for granted! And here's the link to the South Africa blog. Maybe we can be a little more thankful today for all the Lord gives us. Oh, what a terrible thing to say! Aren't we supposed to love weddings and get all happy and teary-eyed at them? Maybe. I don't know whether we can really assign "supposed to" and "should" to our feelings. Before I get too far, let me explain that I love marriage. I love the idea of a good woman finding a good man and making pledges and promises to love and support each other no matter what. I love the idea of two people turning into husband and wife and starting their own family. I really, tryuly believe that is the best way to find happiness and growth on this earth. It's just the wedding itself that is hard for me. I went to a wedding recently. I went by myself, which is a rare opportunity. I got to sit by myself, have my own thoughts, and enjoy the quiet. I took the train and listened to the excited chatter of the group at the back of my train car. They were missionaries headed to the airport and excited about their next adventures. I smiled over them and loved seeing them, as any mother of a missionary does. I said a silent prayer in my heart for them and missionaries across the world - young people away from home, trying to do what is right. In a few years, they will be done with missions and looking to find their own mate they can commit to and love. I took a bus from the train and walked a few blocks to get to the wedding. It was beautiful and full of love. I couldn't help but think of my own wedding when I was as young as they were - 23 years ago. I was thinner and simpler then. My only worries were getting through college and loving on the handsome man who had asked me to be his forever. I miss that young Jay. I should have been expecting an emotional crash, this sweet young couple were married in the same temple we were all those years ago. I didn't realize it until I got inside the temple and felt the quiet, but I hadn't been back in this particular temple since Jay passed away. Then I crashed. I hate crying in front of other people, I really do. Besides, this was a wedding - a happy time! Who wants people to be sad-crying big sobs of heartache at a wedding? That would be bad. I didn't want to mar their happy day, and I managed to hold it in until after the ceremony was over. But it was hard, and uncomfortable to sit there alone. Everyone is happy and celebrating togetherness, and I sit there by myself. It's hard sometimes. After the well-wishes, I found the nearest bathroom and gave permission to the tears. I've learned not to fight the sad when it comes. It's too hard and too raw and too real. My poor heart is wounded more by the sharp edges being stuffed back in than in the release of the emotions. Crying in bathrooms is good because there is plenty of tissue, and cold water to splash on your face when you are done. I will always be a widow. Yes, I've remarried and chosen to share my life again. But those first memories of being a newlywed - a young wife - will always be a big part of me. We fit together, we learned together, we grew up together. 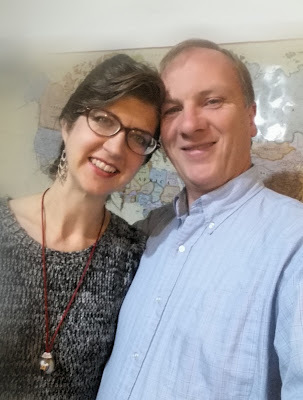 My life was shaped by his as we figured out how to live harmoniously together. That doesn't go away. Neither does the pain of his loss. He was only 38 - far too young to go. I never would have imagined being left a widow at 33. Far too young. But I survived. And I fought my way through the waves of grief that, over time, don't crash over me quite so viciously, or hold me under quite so cruelly. I've learned to pick myself up and keep going. I've learned that if you cry with your head bent over your lap then the tears fall straight down into your tissue instead of running down your face first. I've learned when not to wear mascara. I've learned to sob silently. And I've learned how to cherish Jay's memory without making my heart sting. I've learned how to let my heart grow by accepting new things of love and beauty. I've learned to accept that this part of me will always be there. I'm better for having gone through all that. The fight made me stronger. I'm softer because of the pain. The grief gave me compassion. 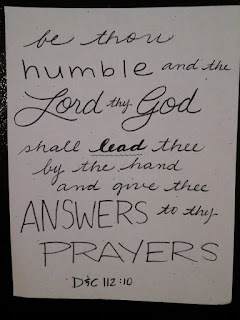 The heartache taught me to rely on the Lord, and He has always been a rush of peace for my aching. I recently remembered eating my mom's pull-aparts. She would take a few rolls of those cheap refrigerator biscuits, pop them open - that was my favorite part. She dipped the dough circles in a mixture of melted butter and orange juice concentrate and "snug them up" in a bundt pan. She'd bake them until the house smelled warm and citrus fresh, then invert the hot pan onto a plate. We were supposed to wait until the stuff was cool, but we couldn't wait. Waiting for food when it is right in front of you is hard for a hungry child! We'd burn our fingers a little bit, pulling apart the gooey rolls. Then we'd burn our mouths a little bit by eating them when they were still oven-hot. 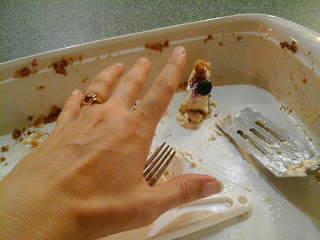 But they were so good and sweet, in spite of the chemically taste of the refrigerator rolls. Hot sweet breads are the best, aren't they? So this week I made my own, with bits of dough dipped in a butter-orange juice mixture. I didn't have my mother's recipe so I just made it up as I went. I wasn't sure exactly - until they came out of the oven and I saw my own children clamoring to pull apart bits of sticky sweetbread. It was a hit. After that, I branched out and tried a savory version. I took a round loaf of bread and cut the top in a cross-hatch pattern, but not quite all the way through. Kind of like slices one way and then slices the other way, too. It ended up looking like a bloomin' onion. I melted butter and mixed in garlic salt and other spices and drizzled it over the bread, making sure to get it in every cut. 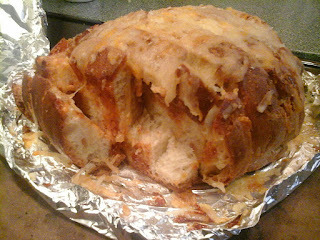 Then I covered it with grated cheese, again getting some in all the cuts. I covered it in foil, baked until the cheese was melted, and stepped back as it disappeared with all my boys around. was gone nearly as quickly. It's good to have good food to feed my family.And I got to remember my mother for a few minutes. Thanks for loving us, Mom. Thanks for teaching me how to love. 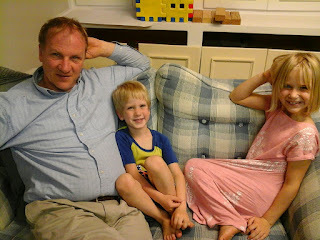 Dad getting ready to tell bedtime stories to Georgie and Angel. They love him so much. 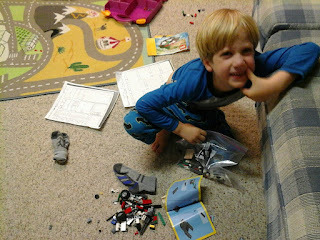 Freddie deciding that he'd rather play with his Legos than listen to a bedtime story. He'll pitch a fit if he misses any of the story, though. 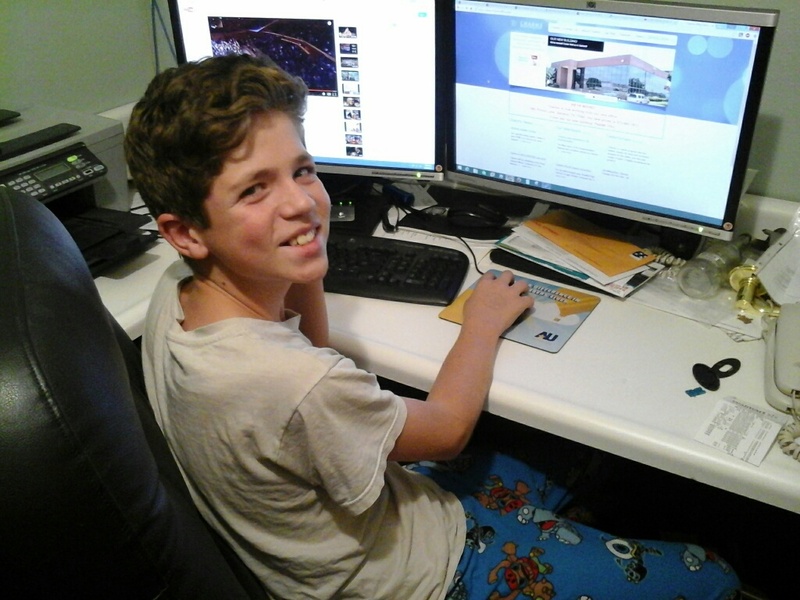 Eddie logging into the computer to report his hours of trombone practice on the band's website. He really enjoys playing it, but I don't know about lugging the big thing to school every other day. I'm sure he's glad it's not a tuba. I didn't get pictures of Chris or David - they are getting to those teenaged years where they would prefer not to have their pictures taken. Still love 'em! Opa is the resident patriarch of a large, loving family including 28 1/2 grandchildren! He spends time working on the model train layout in his garage and loves it when people come over to run trains with him. Dad loves helping everyone around him. He is a whiz in the kitchen and really enjoys cooking and baking. He sang with the Mormon Youth Choir, and signs ASL beautifully. 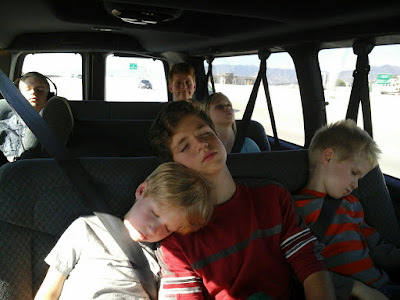 Mom enjoys spending time with her family and sleeping. If she remembered what a hobby was, she might write, dabble in graphic design, hand-letter calligraphy, or crochet. 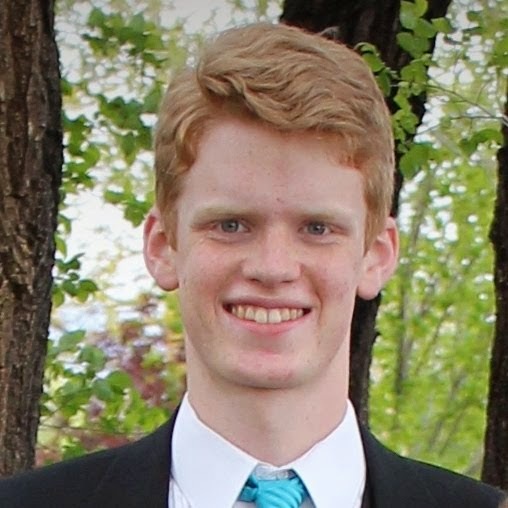 Alec (21) is serving a mission in Cape Town, South Africa. He is learning great things and growing, and will be coming home next March. 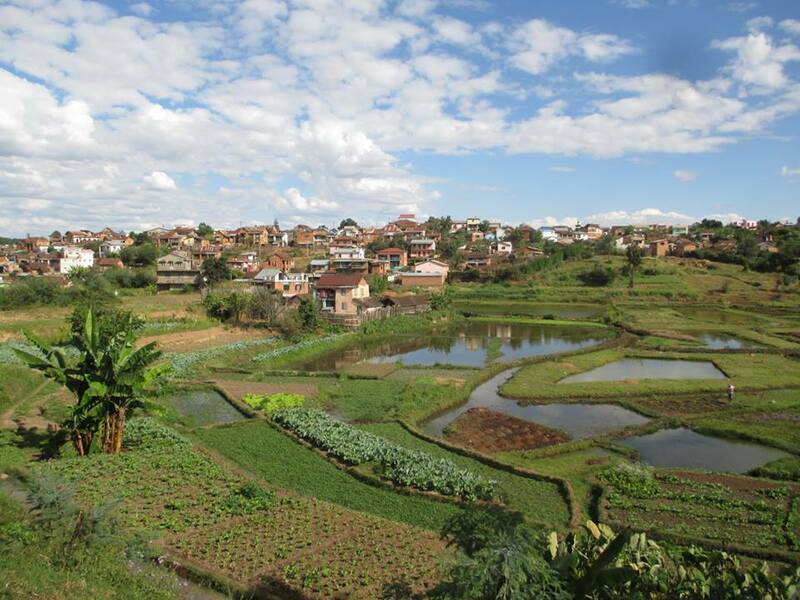 Ben (19) is currently loving his mission in Madagascar. He loves to learn and play basketball. No, he hasn't seen any lemurs, but he has learned to like rice. Chris (17) is a senior this year and looking forward to track and field season where he runs hurdles. He has a real talent for computer animation and 3-D modeling. David (14) is in ninth grade. He likes singing, dancing, and being with friends. He enjoys track and field, building things, and solving problems. He likes cooking and baking bread for his mission fund. 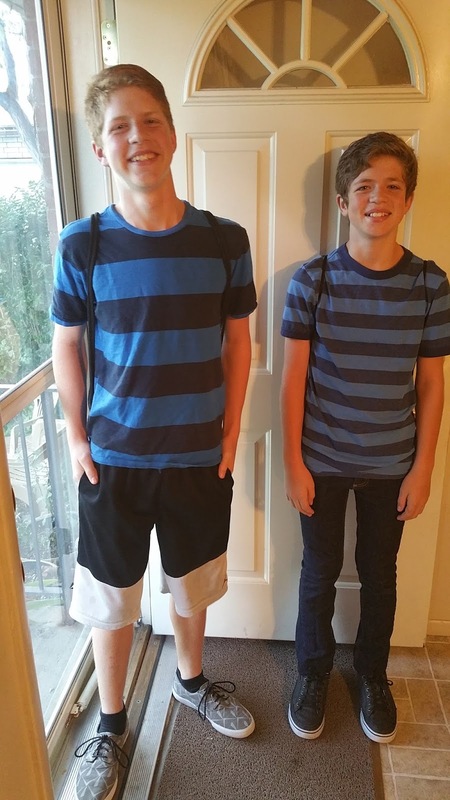 Edward (12) is in seventh grade. He likes eating, sleeping, reading, and hanging out with friends. He is learning to play the trombone and guitar. Angel (7) is our little ray of sunshine. She's doing great in first grade in spite of her tumble out the window a few years ago. Miracles do happen - thanks for your prayers! 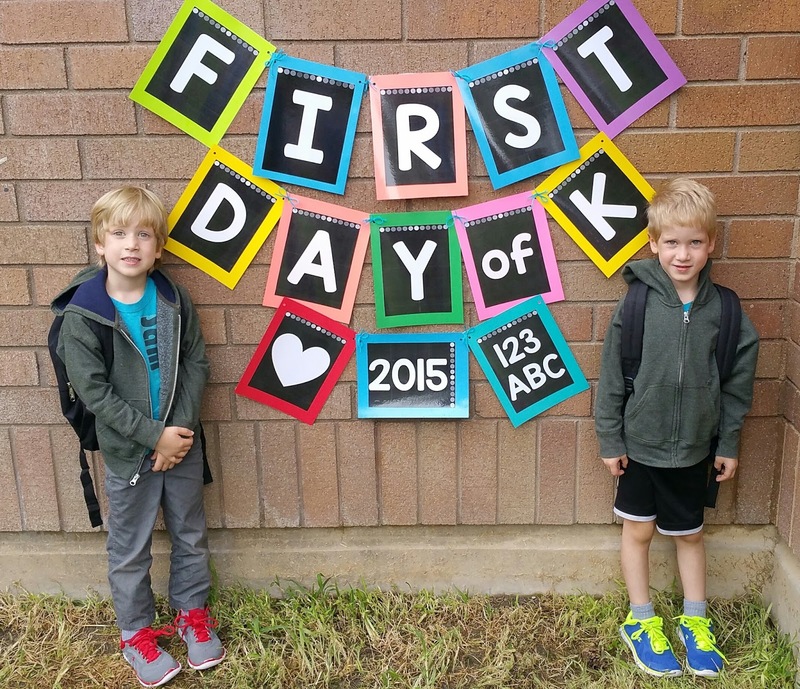 Frederick and George (5) are loving kindergarten. Fred likes playing the piano, giving backscratches, and playing with Legos. George is becoming a good writer and likes to build things with any kind of blocks. Our favorite meal is traditional Sunday tacos where everyone pitches in to help each other get to the eating part! Working together takes a lot of the stress out of our Sabbath meal. Favorite family traditions include our annual family birthday party with pizza on fine china, measuring up every birthday on our growth chart, and monthly Family Home Evening with all the cousins. Some weeks are good and some are not so good. And sometimes they are good and we don't even know it. Missionaries are encouraged to keep good records of what they do - it helps them to be organized and accountable for their time. They are often encouraged to get better numbers as a way to motivate and encourage them to improve. Some missionaries look at the statistics as an end of themselves, but most I've known understand that the numbers are just a way to track what you are doing with people, and the people are most important. So sometimes when, by the numbers, it doesn't look like you are doing much, you might be accomplishing much more than you think. The real value is the connection with people, and helping them live happier lives. That's a good reminder for me this week, as I try to see progress and growth in me and my children. You can go check out their blogs about South Africa and Madagascar. We went on a road trip over Labor Day. It was fun, and we all enjoyed it. Or mostly all of us enjoyed it, or or we all enjoyed most of it. Probably most of us enjoyed most of it - isn't that how road trips go? 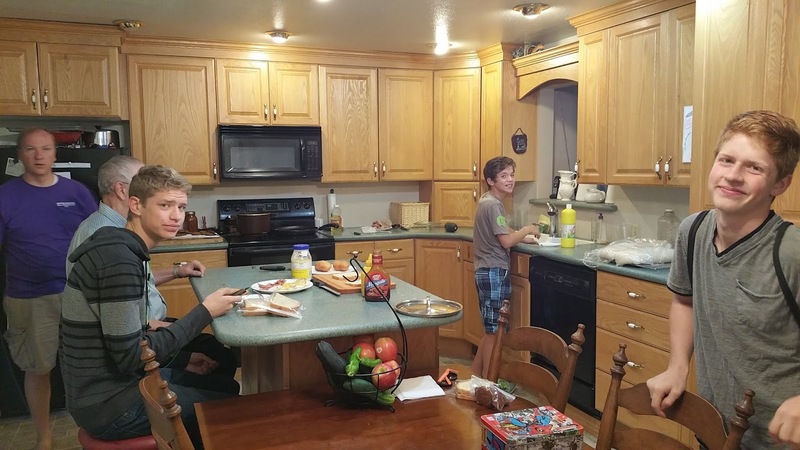 We spent the weekend with our Swain cousins in a lodge with plenty of room for running and an industrial kitchen for cooking up enough grub to feed us all. On the way home, we looked like this - happy and tired and ready for our own home and our own beds. Except David. He seems to be the only one awake, so maybe he should have been the driver. Shh. Not yet. We'll have plenty of time for growing up and not sitting in the back seat anymore. For now, enjoy the childhood. I know I am. When we moved last year - yes, it's been an entire year - we had two weeks to empty out a spacious house and move into a much smaller one. Most of our stuff went into a storage garage that was literally packed to the ceiling with all our stuff. What on earth could we have owned that took up that much space? As a minimalist, I was quite disgusted with all of it. A good deal of it was large furniture items that we could not shoehorn into my dad's already-furnished house. We planned to go through it the garage and clean it out, but it was just crammed in there too tightly packed too efficiently to be able to get anything out. Finally, the day came when we were tired enough (me:of having so much STUFF! and him: of me complaining about it!) that we just had a garage sale. We hauled load after load of furniture and big stuff from the garage out onto the lawn where passers-by could see it. We set out signs and advertised. We brought water and set up canopies so we could sit out there all day long. The stuff slowly disappeared. People drove by and slowed down. An older man, on vacation from California, packed more things into his car than he would be able to drive back home. A couple slowly talked down the price of a tandem bicycle they would ride together. A group of college boys together carried away a heavy side table that they thought looked like a treasure chest. A neighbor girl went home and back three times until she had found enough money to buy an old blue bike. Women wheedled, babies cried, little children carefully counted their coins. 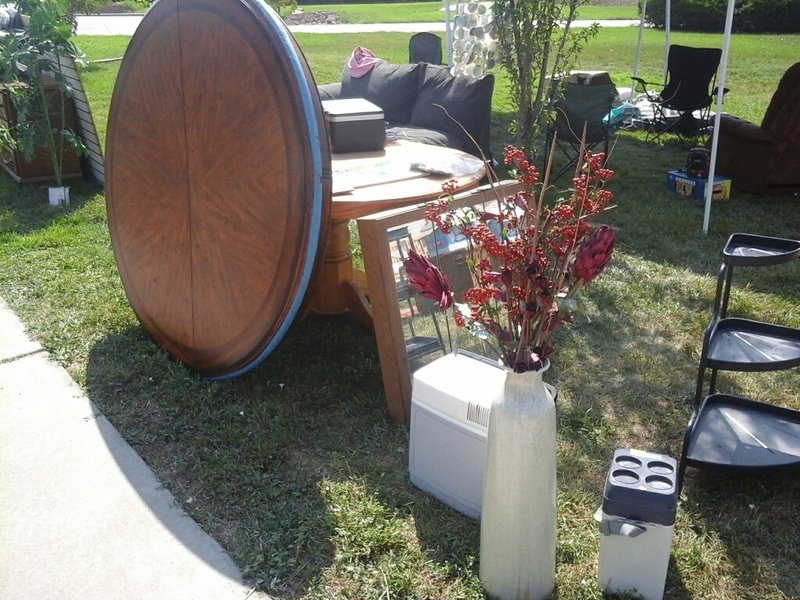 At the end of the day, we loaded up what didn't sell and took it to the thrift store dropoff. We were a few hundred dollars richer and a few thousand pounds lighter. Whew. I thought I'd be jumping-up-and-down happy to see it done. I wasn't. Glad to be done with it, yes. Relieved, yes. But it took more emotional energy than I counted on to let go of things I had loved. I'd paid good money for that stuff - picked it out carefully and lovingly. I wanted it! And the memories attached to each piece were substantial. The ghosts of happy family times pressed thickly on my sentimental heart. I'm sad that I don't have room for some of those nice things, but I'm not willing to store them. Maybe one day I'll have my own house again and I can pick out just what I want to put in it again. Until then, I'll just have to see what I can do to make happy family memories today, with what I have now. School is in session, and we've settled into a comfortable routine. The other day, Eddie came home with a recipe from his "Introduction to Foreign Languages" class. They spend a few weeks with three or four different languages so they can get a feel for them before they commit to a year-long class next year. 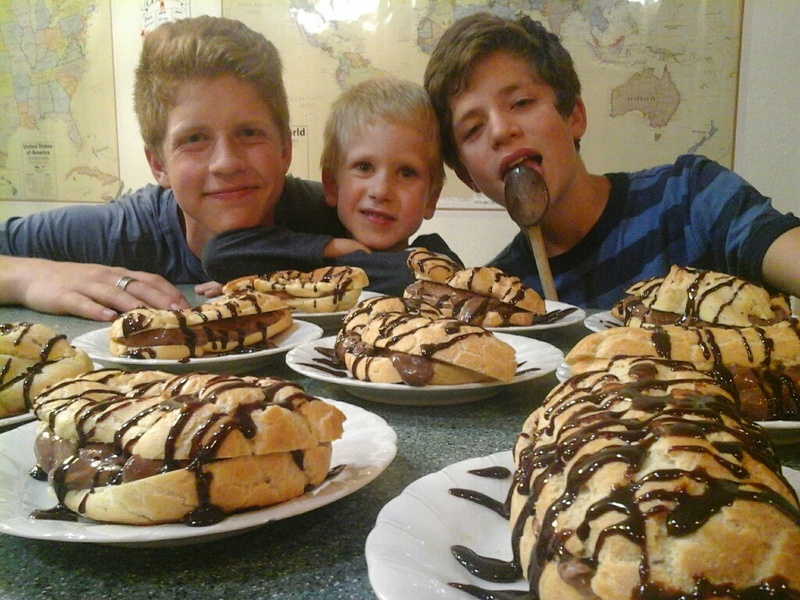 Right now, he is studying French and wanted to make the eclair. Bien sur! 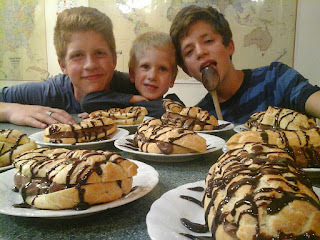 He and David had a great time making them, and everyone enjoyed the eating of them. Georgie couldn't stay away from them for anything! 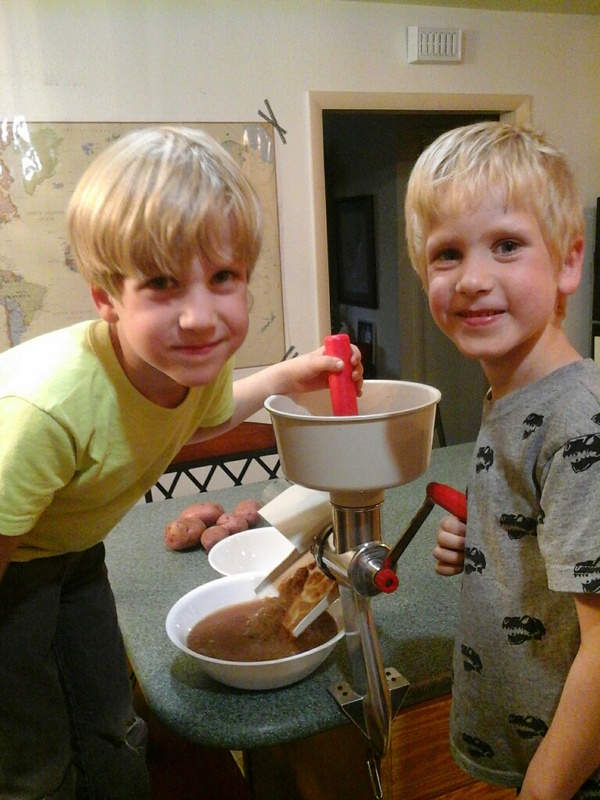 Yes, mes fils, you can bring home good recipes and make them anytime. I might even do the dishes for you. A couple of transfers ago, I got a message from one of my missionaries that his new companion's mother wanted to get in touch with me. Ummm... yes? It turns out that they have a facebook group for parents of missionaries in that area, and they wanted to invite as many as they could get. As an introvert, I'm impressed with the strength of the support from this group. We share news and pictures and heartaches. They freely share ideas and hints and how-do-I-get-things-to-the-other-side-of-the-world. It's been fun to be a part of the group, especially when someone posts a group picture where I unexpectedly see my boy! No, there are no boys, mine or otherwise, in this picture. It makes me think of what a wonderful world it would be if we could all be so supportive of each other. It's an amazing thought, isn't it? 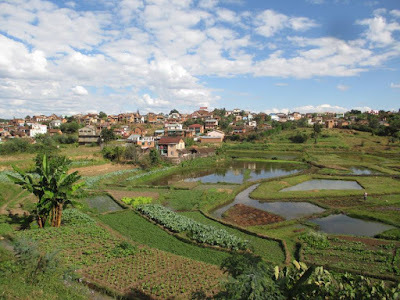 You can click away to read about what's happening in South Africa, and in Madagascar. Pray for these boys, if you would - it really does help and support them! So yeah, we managed to pull off a birthday tea party. I was quite surprised that, despite the short notice, almost all the little girls came! 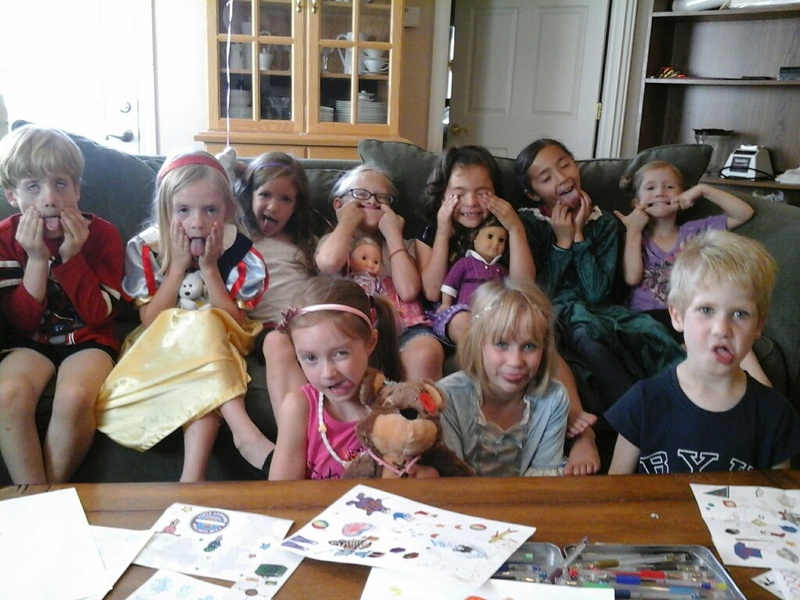 What am I supposed to do with NINE extra little girls in my house? Take deep breaths. The twins didn't even mind being outnumbered. Honestly, I was so busy prepping food and cleaning up and getting things ready (in the middle of the usual Saturday hubbub) that I didn't even think about little girls until quite a few had collected. After so many boys inhabiting our home, it was a little bit shocking to see such a pile of princess dresses and fluffy outfits. I'm laughing at myself. I gave them free reign at a pile of polka-dot paper, sparkly pens, and my old stash of scrapbooking stickers. 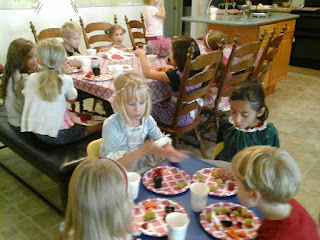 After a giggly while, we set the table for the tea party. We had a little lesson in etiquette, then poured the pink lemonade. It was adorable to hear them demurely murmur "oh, dear," when they dropped something on the floor and hilarious to hear their pretend British accents. I have to admit that I had a good time just watching them, and I tried really hard not to laugh so they could hear. 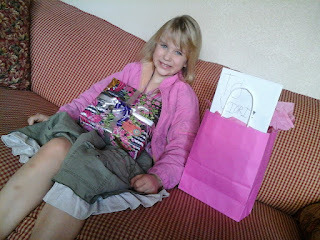 My birthday girl was absolutely delighted by everything, and that made all the not-very-much effort quite worth it. Actually, I'd go to the moon and back for her if she needed it. What mother wouldn't? 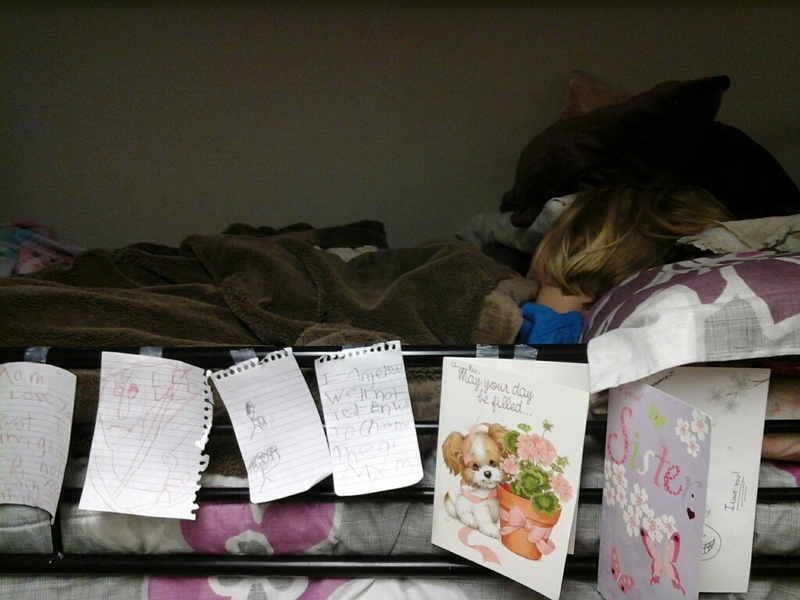 At the end of the day, Angel climbed into the top bunk early and snuggled into sleep with her favorite pictures and birthday cards taped lovingly to the rail (with the roll of tape I gave her 'cuz I was tired of losing mine to her. Win.). I love that the last card on the right is one Alec sent her from South Africa - last year. It's a prized possession. Oh, how we all love this girl! It's Angel's birthday. 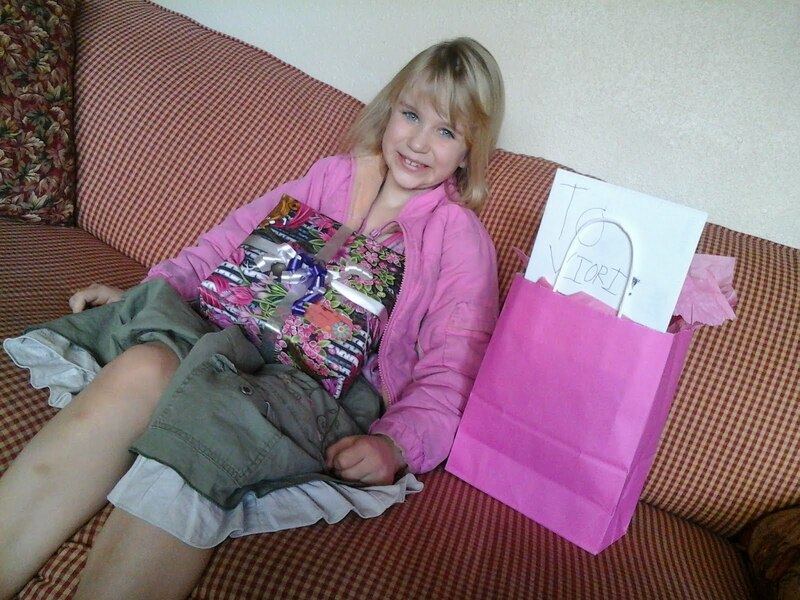 That sweet little girl of mine is turning 7! I think I am getting old because these little ones of mine seem to be growing up faster and faster. Before long I'll be telling stories about my rheumatism. 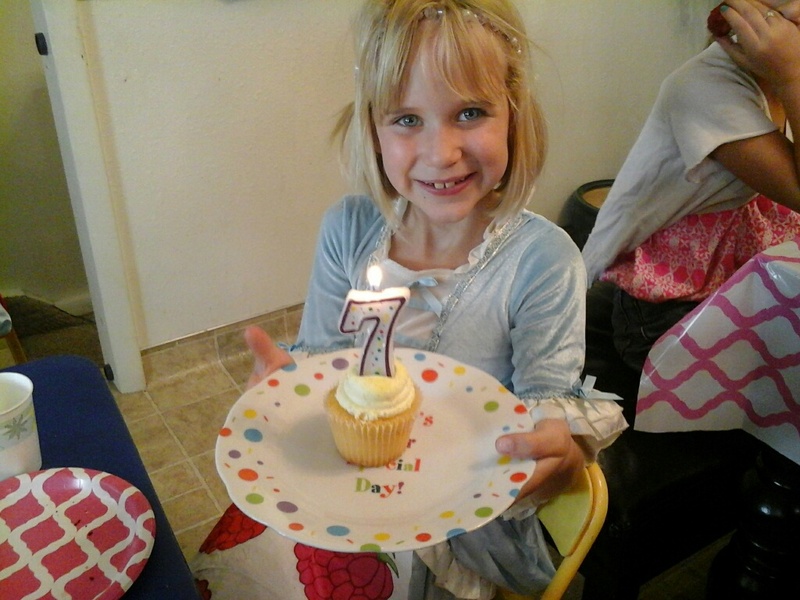 She has been planning her birthday party for... oh since about the last birthday. And she wants everything under the sun, I swear. Fortunately for me, her enthusiasm works better than her memory, and she is easily delighted. Last year, we moved to a new house right before my birthday, so I was successful in begging off having a party. This year I have no such excuse and we will be having a tea party. She wants all her little friends to come, and I think there are about three hundred and seventy of them. She wants plenty of goodies to eat, too, and has specifically requested doughnuts and cupcakes and brownies and pie and cookies and a birthday cake, of course. She wants herbal tea or maybe lemonade and juice is good and I really like soda but we don't have it very often but can we have it for my party please Mom? And we can't forget the pinata. I'm looking on this page for ideas of fun things to do at the party because I'm not a very good party planner. I'm not a very good party-goer, either - I'd much rather stay at home. But I'll throw a party for my little butterfly because I love her. It's a good thing she is only 7 and hasn't had a lot of experience going to parties, because my parties are decidedly low-key. I am totally impressed with mothers who throw all-out parties for their kids - don't get me wrong. There are some pretty amazing parties going on out there! I'm just not one of them, and I've finally decided that it's ok. I think we'll pass out markers and let the kids decorate their plates. If I'm feeling really well, we'll make fancy hats out of paper plates. 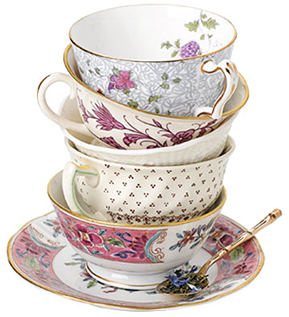 We shall have a little lesson on tea-party manners, and serve tea and crumpets. Or something. With our little fingers extended, we shall try not to slurp. We could even frost cupcakes. Afterwards, we will break open a pinata in the front yard, stuff everyone full of candy, and send them all home. Good enough. I'll let you know how it goes. I got a hold of some markers and a sheet of green cardstock. I had some time while I was sitting in a less-than-gripping meeting, and this happened. No, I didn't do the silhouetting with a Sharpie, but wouldn't that be cool if I could? I'm not fond of how the font turned out for "am a", but I like the rest of it. 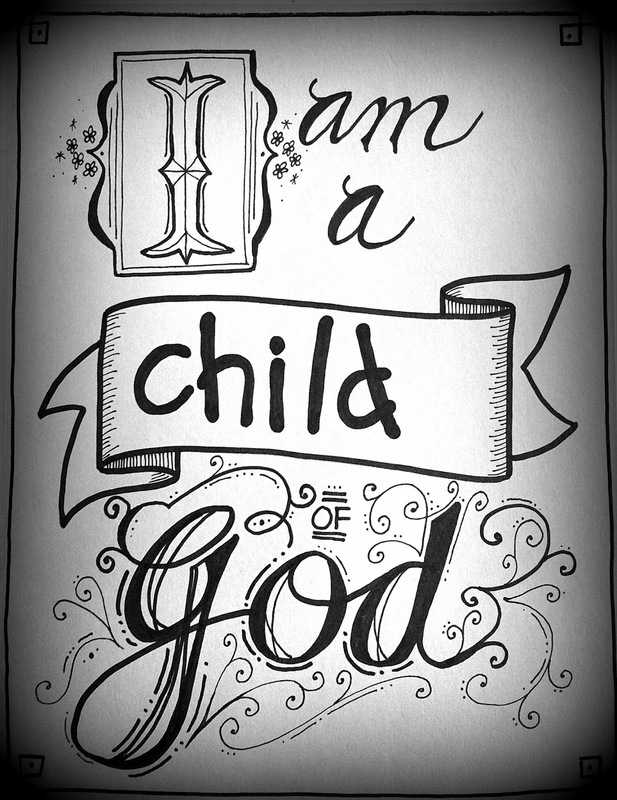 I wanted the "I" to be special, because we all have that infant divinity in us. I wanted the "God" to be complex and beautiful, because He does so many amazing things for us. The more I sat in the meeting (on a hard chair. Ouch! ), the more doodles got added on the end there, but I guess that is the way God is - always adding and expanding and loving us. I am a child of God. It brings me such comfort and direction. I hope you can feel that, too. I'm having some reality checks while my boys are on missions. We have so much! We have so many things that we take for granted - and then have the audacity to complain about. Must repent and be more grateful. Usually there's one room (to the house). And it might have a bed, maybe two, some reed mats you can sit on, and maybe a little chair or bench. Then there's usually a table that they keep there stuff on and sacks full of their clothes underneath. Sometimes they store their clothes under the bed. They usually cook on a charcoal stove outside. Only very rich people (like our branch president) have ovens or gas stoves even. The missionaries usually have gas stoves. But we ran out of gas three weeks ago and Fort Dauphin does not have any at all... So we're still waiting for it to come from Tana. But since most people only have one room houses, there aren't really kitchens. They'll just have a cutting board maybe and then two or three pots and one little charcoal stove that fits one pot. So cooking happens outside, unless it's raining, then you just have a smoky house. Don't worry about us not having gas, I've been eating dry ramen every day. (For games) there's kinety which is a marble game, then there's kinety be which is bocce ball with metal balls. Then there's soccer with balls made from trash bags tied together, some games with bottle caps, and some toy trucks made from from garbage scraps. Those are the biggest ones. Wow. I have an awful lot to be thankful for! You can read more about how the boys are doing in South Africa and Madagascar on their blogs. My babies just started kindergarten. Wait... what?? 'Twasn't very long ago that I was holding them both in my arms, smelling the scent of their little heads... wait, I did do that a few days ago. They are big and heavy and wiggly and I could only hold them both for a moment, and I think I threw out my back. But it was wonderful to hold them both, and they laughed and then demanded to be let down. I bought them new shoes for school. One pair is red and the other is blue, because those are their favorite colors. This is the first time I have bought different-looking shoes. Usually I just buy two pair of the same kind of shoe, and then wish I had bought three pair so we would never have to worry about finding that one shoe that is lost. Except that we would just have more shoes to lose, I'm sure. These things never turn out the way you want them to! As we got their feet measured and started looking at the shoes, I realized that their shoes were much longer now than they are tall. 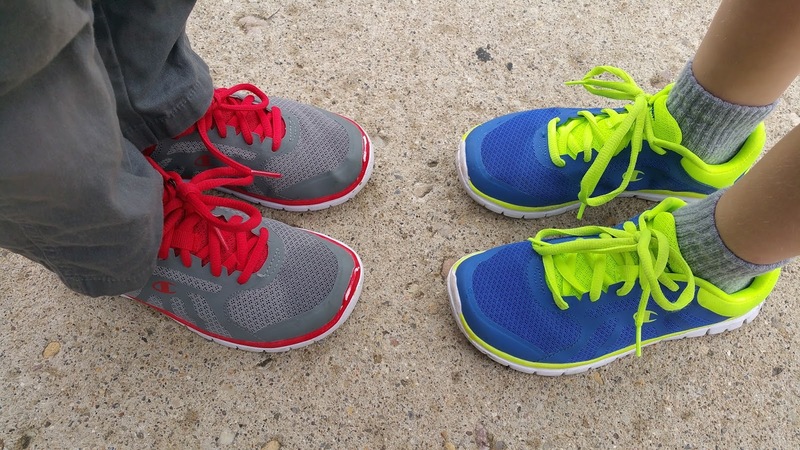 Baby shoes are taller than wide, and the ratio goes quickly to an as-tall-as-wide blob that looks like cartoon feet. I love those little round shoes. And now they look like big boys - with laces! They learned how to tie their shoes in a day. In a day! They are big boys now, with real shoes and backpacks. We walked them to school, Trent and I, and slowly made our way home. The house felt empty and quiet. I've seen this milepost coming for two decades - the day when all my children were in school. It happened briefly when Eddie started kindergarten, and Angel was born a few weeks later. But now it's the real deal. I had a good cry about missing my babies - all of them. 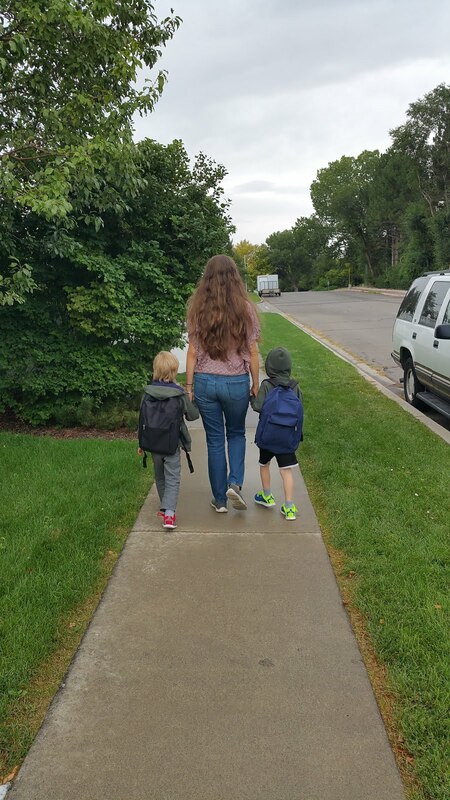 There will be no more new kindergarten children clinging to my hand and nervous to go into the giant, busy school. Oh how I've loved being a mama for my babies! We're starting a new chapter here, and I have no doubt that it will be filled with as much love as the last chapters. Maybe even more. What happened to the summer? I blinked and it was gone - and now it's time for school to start. This year, we have a senior in high school, a freshman, a seventh grader, a first grader, and two kindergartners. We wake up early, have breakfast and make lunches with the high school and middle school kids. We read some scripture and say our morning prayers. That seems to make the day go better. Then Trent and I have half an hour to talk and plan the day before we start the second shift. The elementary school kids get up and dressed. Opa comes out and we have second breakfast. We should be Hobbits. We talked about having the little kids get up with the big kids, but decided that this was a more grown-up time we could spend with the big kids, and good, uninterrupted discussions don't happen very often with them. We cherish those moments. Before we know it, they are all off to school. Before we know it, they will all be gone, just like the summer. Love these kids, and I'm so grateful I get to be their mother!